Keep two garden hoses tidy and conveniently placed using these RL Flo-Master Hose Reels with 65' of Hose. These two, handy units offer all you need to accomplish your watering chores on either side of your home. The heavy duty, polypropylene reels each hold 65' of garden hose, preinstalled for use in moments. Each unit also has an adjustable nozzle with 8 settings, for you to gently spray your seedlings or use a direct stream on a single garden spot. The hoses extend with ease from the reels, and an automatic stopping system locks them in place at your desired length. Use the innovative rewind function to slowly reel your hose inward on each for easy storage. 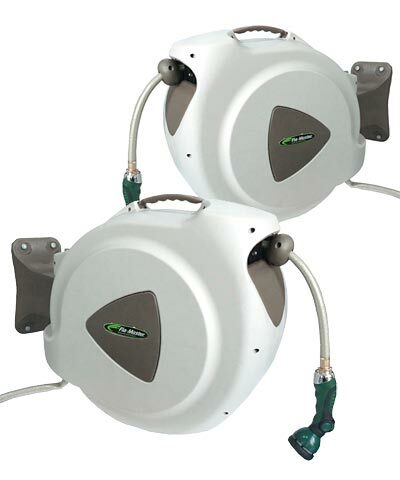 The sturdy reel housings attach to a brick or stone wall with their mounting brackets and included bolts, while an additional 70" length of extra hose on each connects to your outdoor spigots. A metal rod holds each mounting bracket and reel together, allowing the assemblies to pivot up to 180° for thorough lawn coverage. A plastic orb near the front of each hose acts as an automatic stopper, and the polypropylene construction withstands use for many seasons. Keep your garden and lawn perfectly watered and organized with help from these Hose Reels with 65' of Hose. One year limited warranty. Note: This case pack includes 2 of the RL Flo-Master Hose Reels with 65' of Hose.